A Cuyahoga County councilwoman is defending herself against claims she ignored complaints about a women’s shelter in her district. 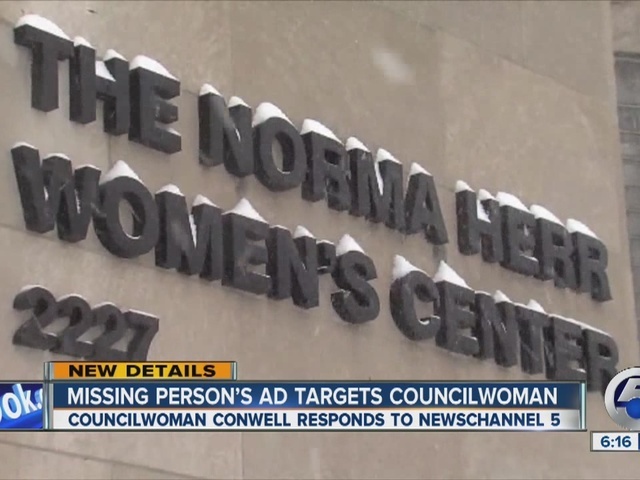 The Northeast Ohio Coalition For The Homeless put out a flyer in the style of a missing person’s ad, with the title “Missing Elected Official.” The group claimed District 7 Councilwoman Yvonne Conwell had not responded to allegations of unsafe conditions at the Norma Herr Women’s Center on Payne Avenue in Cleveland. Ramona Turnbull lived in the shelter for months and recently found a permanent home. newsnet5.com’s Derick Waller had no problem finding Councilwoman Conwell on Wednesday. “That upsets me when someone says I’m not compassionate or I’m missing in action because I’m the one that reached out, got the ball rolling,” Conwell said. She explained, since newsnet5.com’s last report on the issue in October , she’s secured more than $300,000 in new funding for 30 extra beds and seven full-time staff members. “Not only do I try to work on the current issue, I constantly have seminars and talk to women and children and families, how do we prevent getting there?” Conwell said. Davis believed those 30 extra beds will not be enough. The shelter does not turn anyone away. Some women are forced to sleep on the floor. Conwell said they can only fit so many physical beds inside the building in order to comply with the fire code.